A tale of two santas is my favourite episode. I cant really pick its too hard so im just gonna go with "The Deep South"
edit: I really thought about it and I changed my mine, hands down "the luck of the fryish"
three-way tie between war is the h-word, brannigan begin again, and the luck of the fryrish. and The Problem with Popplers because of Free Waterfall Jr.
oh ya and I can't forget X-Mas Story...love that one! ^and then I, Roommate one of the worst? No need to apologise. Given the number of native English-speakers around here who butcher the language on a regular basis, no-one's likely to notice. @Bender72: Was it never broadcasted on a french tv station ? In France, The Simpsons is known (a lot of success ! ), but Futurama isn't known (no success ) ... Is it similar in America ? Luck of the Fryrish. 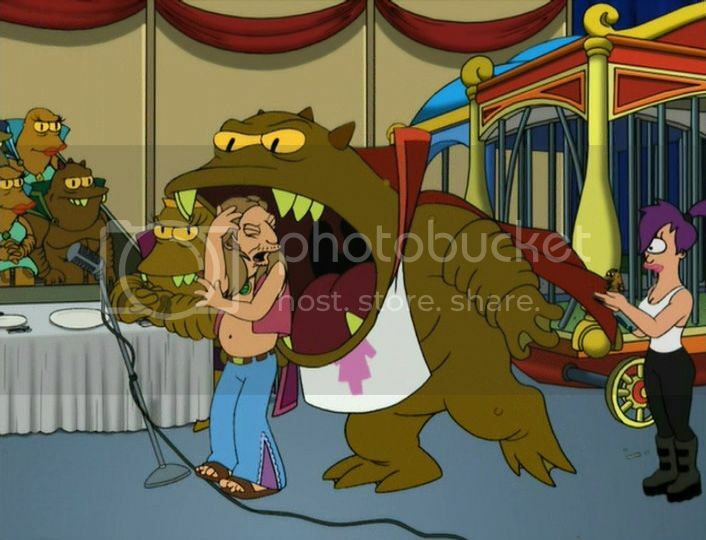 Incredibly funny and has that emotional connection you need for a truly classic Futurama episode. My favourite has to be Amazon Women In The Mood. The snoo-snoo part is epic. I never liked Devil's Hands for some reason. Oh, and I forgot Bender Should Not Be Allowed On TV! How could you not like that episode?! My favourite episode is "Jurassic Bark", it's sort- of a sad episode, It's my fave!